Our passion is championing great wines. A San Jacinto, California native, Randy Record has been active in the farming community for over three decades. Record currently owns and operates a wine grape vineyard and winery in Paso Robles with his wife and two daughters. 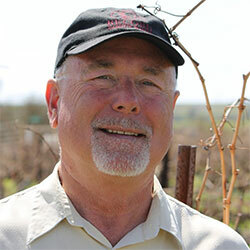 He is currently a member of the California Association of Winegrape Growers. Record is the immediate past Chairman of the Metropolitan Water District of Southern California board of directors and also serves on the Eastern Municipal Water District board of directors. He is Vice Chair of the Association of California Water Agencies Ag Committee and an at large director on the California Farm Water Coalition board of directors. Record earned a bachelor’s degree in agricultural management from California Polytechnic State University, San Luis Obispo. He and his wife, a retired San Jacinto school teacher, have two daughters; one granddaughter and three grandsons. The Pacific Rim International Wine Competition was founded in 1985 at the National Orange Show Fairgrounds in Southern California. The founding members included wine lovers, educators and vintners.